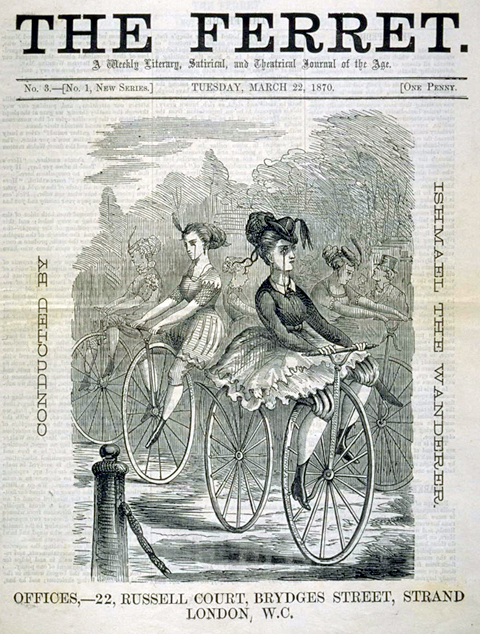 1868-70 was the heyday of the velocipede in France. This novel means of personal transportation caught the public imagination, and blacksmiths, carriage makers and wheelwrights across the country were inspired to construct either parts for velocipedes or complete machines. French makers in this period are renowned for the high standard of their workmanship. Unfortunately, the Franco-Prussian War, which took place between 19 July 1870 and 10 May 1871, ruined the new velocipede-building industry in France, and production moved to England. The International Velocipede and Loco-machine Exhibition at Crystal Palace in September 1869 saw over 200 machines, from Britain, France, Belgium, Germany and America on display. But, such was the popularity of this novel form of personal transportation in Britain, that British production soon outnumbered that of other countries. French velocipede manufacture stopped in July, 1870 when the war broke out between France and Prussia. The British bicycle industry was founded in 1869 and, as a result of the war in France, Coventry took over from Paris as the world centre of velocipede construction. British velocipedes were built to a high standard of engineering, though, in Britain, functionality took precedence over aesthetics. This velocipede is manufactured to a very high standard, typical of many of the French machines. French velocipede builders had a head-start on their British contemporaries, and it’s amazing how many variations in style there were in France between 1868 and 1870. Unfortunately, most of them do not have the maker’s name and, with few catalogues printed at the time and the failure of the French industry in 1870, it’s not easy to identify them. As French velocipedes were built before the war and production did not resume when the war ended, surviving French machines must have been stored safely for the duration, and maybe moved out of Paris. This velocipede has therefore survived three wars with Germany.